At Whitehouse & Company we believe in Open Source technology. We use WordPress for almost every website we design as it is a rock solid CMS which allows our clients to actually use their websites to interact with audiences, rather than create static experiences. WordPress started, back in 2003 when we were still using the free blogging system Movable Type. Unfortunately in 2004 Movable type decided to tighten their licensing and start charging for use of their software and stop distributing a free version. This fundamental change made us jump ship and swim over to WordPress, which at that point was a huge switch in our process. We had never fooled around with PHP and having to learn, albeit superficially, a programming language was a huge undertaking for busy graphic designers. Movable Type later realized the error of their ways and created a free version for personal use, but by that point it was too late, we were addicted to the open source WordPress. Almost 10 years later we are still happy WordPress users and have donated, on behalf of ourselves and clients, hundreds of dollars to the application’s development. However, WordPress is now arguably more CMS than blog software. For our client’s professional sites, this is a good thing, but when you compare WordPress to the ease of use of Tumblr for blogging, it falls short. It lacks the “get out of your way” mentality that Tumblr uses to spotlight content and spur conversation. WordPress is a wonderful website creation tool, but as a blogging system — it is a little overwhelming for a quick post. Tumblr, however, is not open source, nor can it be hosted on your own server and the content owned exclusively by you. 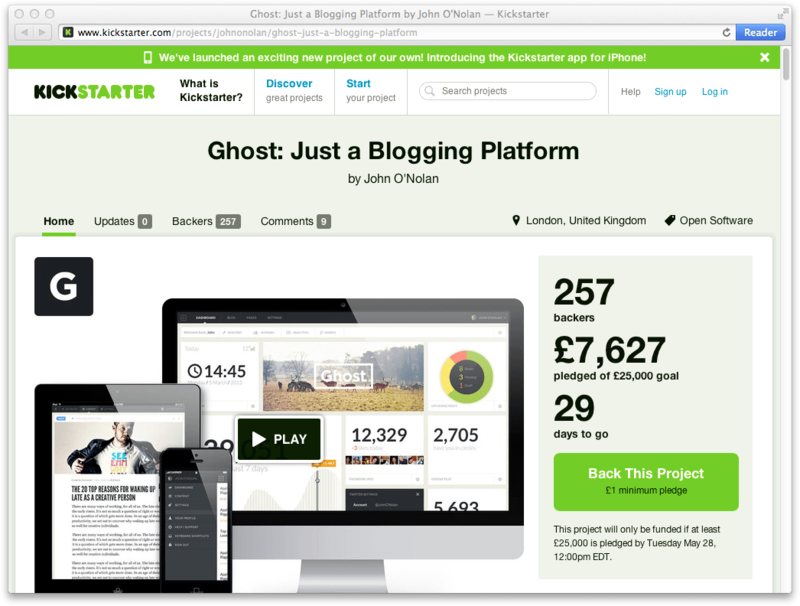 In light of this, and in the interest of supporting options in the Open Source community, today we have backed the Kickstarter campaign for Ghost, a new platform for blogging. It looks both beautifully designed and elegant. 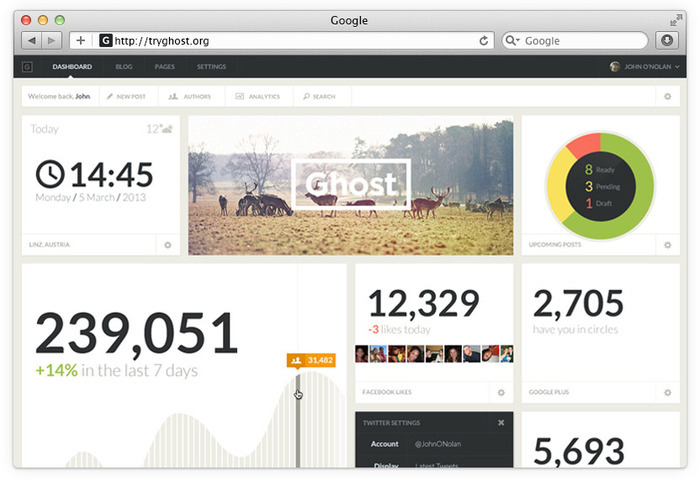 Best of all, Ghost will be free (if fully funded) for anyone to try, use, experiment and most importantly — express themselves. Give it a look, and if you agree with their mission, donate a few pounds… they’re English. Even in the short space of time from yesterday to today, the Kickstarter has rocketed from £7,000 when we funded it, to an impressive £45,000. So it looks like Ghost will be a successful reality for everyone. They are still raising money and if they raise enough they will add benefits to supporters. Go help them out if you haven’t already.